Please visit the Supply Post Team, Saturday June 10th and Sunday June 11th, booth #110 @ The Largest and Most Anticipated Truck Show in Western Canada. , we have Candy and Tattoos for the kids! Door Prizes & Children's Wish Foundations Tickets. http://www.childrenswish.ca/apnaraffle. SafetyDriven – Trucking Safety Council of BC will be hosting the Speaker Series on Health & Safety. 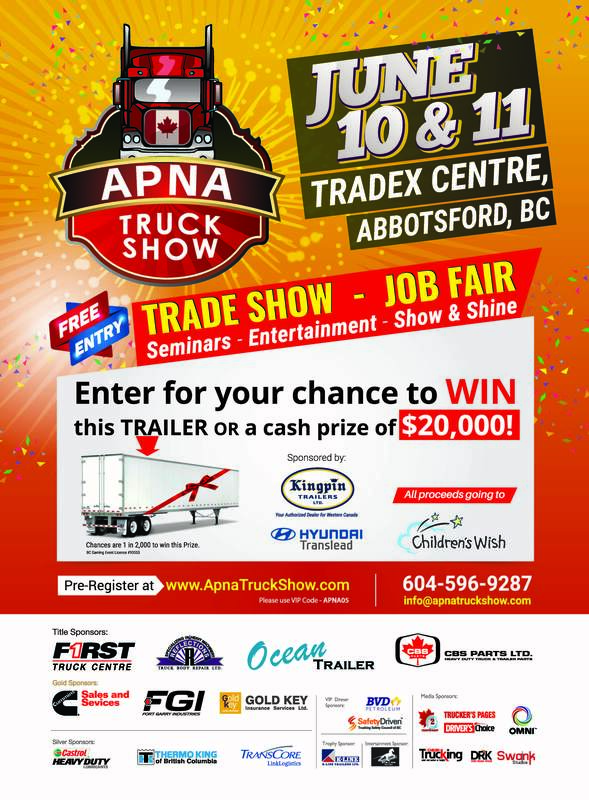 This FREE event will be held ONE DAY ONLY on the first day of the APNA Truck Show on June 10th from 12:30 – 4:30. There will be lots of opportunity to ask questions! After 8 years with the CFL, Shea suffered a career ending injury during the first game of the 2015 season. Come hear how he overcame his personal battles with happiness and health. Title: COR. What is it, and What Can It Do For You? Come listen to your fellow industry professionals and learn why they chose to go for COR. Food can be the problem, but it can also be the solution. Join Diana for some practical and do-able tips on how you can make small changes to your diet with big results.